Haiti had sent 15,000 people. They "all have AIDS,” he grumbled, according to one person who attended the meeting and another person who was briefed about it by a different person who was there. Forty thousand had come from Nigeria, Mr. Trump added. Once they had seen the United States, they would never 'go back to their huts' in Africa, recalled the two officials, who asked for anonymity to discuss a sensitive conversation in the Oval Office. Trump's words about minority immigrants are strikingly different from those he has made about immigrants from predominantly white countries. Following his “****hole” comment, Trump “suggested that the United States should instead bring more people from countries like Norway, whose prime minister he met yesterday. The White House may say that Trump does not have a problem with people immigrating from predominantly minority countries, but it appears that he talks about them very differently than those coming from predominately white countries. elpablo21 and itsaboutthattime like this. must have been taken from twitter, aint that right @dwalk31? big panda, whywesteppin, voidemperor and 25 others like this. dwalk31 and Diego Pasta like this. I keep this and da race card on deck at all times to destroy Libs and Soy Boys. AEA18, Mark Antony, boris and 5 others like this. Here is Trump praising criminal target Paul Manafort, at the time under indictment for obstruction of justice and conspiracy to obstruct justice, as well as a bunch of financial crime charges and unregistered foreign lobbying. Manafort later ended up being convicted on 8 financial crime charges and would have been convicted on all counts if not for the lone holdout Trump supporter who blocked the remaining charges. Manafort also ended up pleading guilty to the one of the obstruction charges; one count of conspiracy to obstruct justice with former GRU officer Konstantin Kilimnik. As seen in the latest Manafort hearing transcript, Mueller's prosecutors believe Kilimnik is central to their 'collusion' investigation and also believe that at least one of Manafort's lies during his cooperation, the one about the sharing of highly detailed and confidential polling data with Kilimnik, was done to "at least augment his chances for a pardon"
Prosecutors also stated that the clandestine August 2 meeting at the Grand Havana Club with Manafort, Rick Gates and Kilimnik is core to what the Special Counsel is tasked with investigating, including potential coordination between Trump campaign associates and Russia. Prosecutors state that both the Ukraine peace plan (pro-Russia sanctions lifting deal) was discussed at that meeting and Manafort also gave Kilimnik a full walkthrough of the highly detailed and private polling data. The next day, Kilimnik flew back to Moscow from NY on Oleg Deripaska's private plane. Prior to the meeting, Kilimnik emailed Manafort that he had spoked to Deripaska for 5 hours and wanted to discuss at the meeting. In an email to Kilimnik around that time, Manafort also offered to provide "private briefings" on the Trump campaign to Deripaska. In November 2018, Trump told the NY Post he saw no reason to rule out a pardon for the then convicted felon who pleaded guilty to conspiring to obstruct the Mueller investigation with former Russian intelligence officer Kilimnik. Here is Trump praising another criminal target for refusing to cooperate. At the bare minimum we know for certain that Stone withheld documents from Congress with a brazen lie, stating he had zero relevant documents despite having numerous emails etc. that fell under the scope of the committee's document request and questioning under oath during his testimony. On the very same day of Stone's testimony, Stone and Randy Credico exchanged 30 text messages despite Stone's blanket denial that he had any such communications. Here is the president lying about a search warrant and falsely accusing the FBI (and the judge) of illegally breaking into Cohen's office, while also calling federal cooperating witness Michael Cohen a "rat." Here is the president appearing to attempt to intimidate/threaten cooperating witness Michael Cohen by attacking his father-in-law and suggesting he should be investigated. Here is the president again appearing to attempt to intimidate cooperating witness Michael Cohen, this time attacking both his father-in-law and his wife. 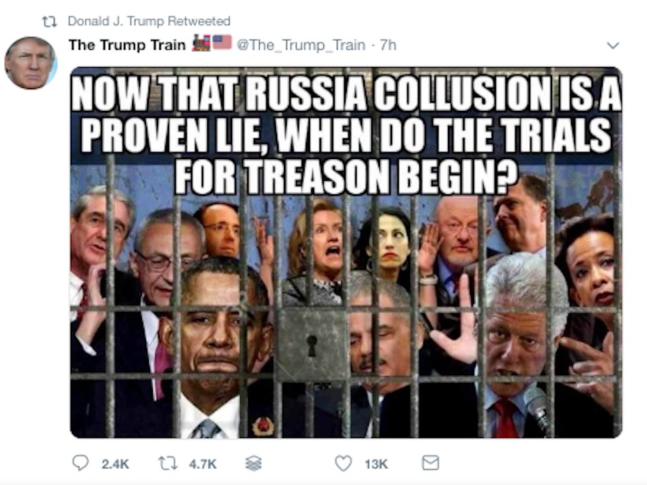 Here is the president promoting and advocating for treason prosecutions against the Special Counsel and Rosenstein, who appointed him, as well as a variety of other political rivals and a cooperating witness against the president. Trump has also repeatedly falsely accused the latter of crimes, citing no evidence. When asked later by the NY Post on why he shared that image of Rosenstein behind bars, Trump responded "he should've never picked a special counsel." 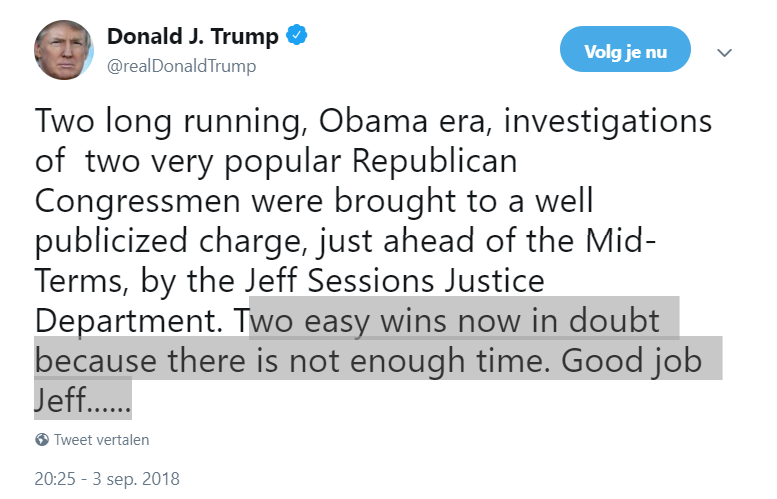 Here is the president bashing Sessions for following DOJ policy and indicting 2 Republican congressmen who were up for re-election in the midterms. That cooperating witness better not testify to Congress about potential obstruction of justice! 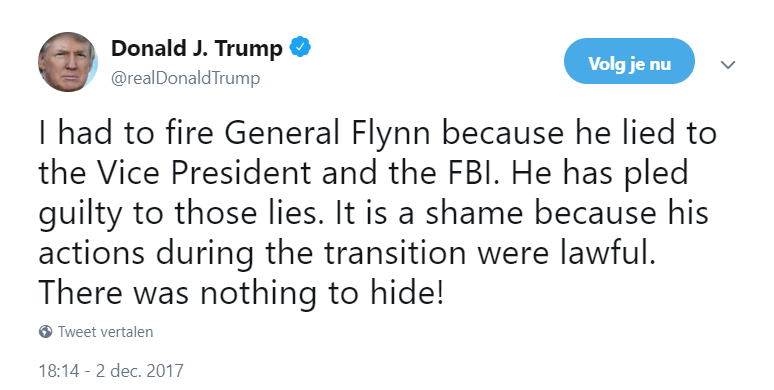 Here is the president admitting he knew Flynn was under criminal investigation for lying to the FBI when he allegedly asked Comey "I hope you can see your way clear to letting this go, to letting Flynn go" according to Comey's sworn testimony. Before having this conversation, Trump allegedly removed everyone from the room, including AG Sessions. boris, itsaboutthattime and aepps20 like this. Do you have a jpeg of this pic? My next avy. kdawg, infamouserror, mastamind033 and 3 others like this. elpablo21, boris, Diego Pasta and 2 others like this. AEA18, elpablo21, deuce king and 2 others like this. AEA18, BIG LEEMELONE, cubanref and 3 others like this. mastamind033 and Diego Pasta like this. It's true, notice how no rallies (even within the states he won) are ever located in places where people actually want to live. Beto O'Rourke looks like the mayor from Blankman. AEA18, erupt, boris and 3 others like this. AEA18, OlDirtyReseller and dwalk31 like this. vaphenom06, AEA18, OlDirtyReseller and 3 others like this.